Yes, you read that right, Vote No Supporters. You’re all a bunch of godless heathens. Wow. This is quite the first shot across the bow. Fasten your seat belts everyone – we haven’t even yet seen the TV ads aimed at scaring the bejeezus out of parents, trying to con them into thinking that if they vote no their kids will suddenly be forced to attend cross-dressing “genderless marriage” lessons in school. I know it’s not a biblical saying, Your Grace, but surely you’ve heard the one about the concrete to hell being poured with the kindest of sentiments? Really, I think Vote No supporters can take some solace in yesterday’s performance of All The Archbishop’s Men. You see it, and Mr. Darrell’s subsequent offensiveness, were inherently defensive. You see, the campaign to defeat the Amendment in Minnesota has done what no other campaign on our side has done before: engage in aggressive organizing in faith communities. 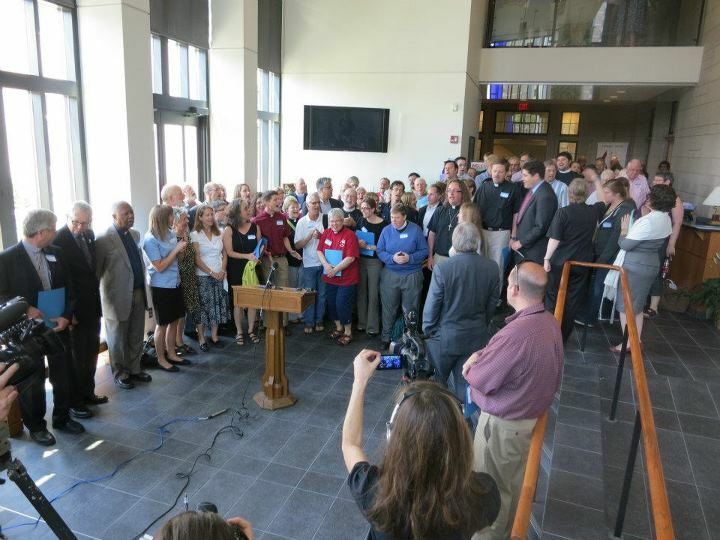 As the campaign pointed out in response to Mr. Darrell, the coalition to defeat the freedom-limiting Amendment includes 118 Churches and religious communities; the Episcopal Church in Minnesota; Catholics for Marriage Equality; the Minnesota Rabbinical Association; 404 members of Clergy United for All Families; five synods of the Evangelical Lutheran Church of America; the Minnesota United Methodist Conference; the Presbytery of the Twin Cities Area; and, yes… also atheists. The kickoff press conference of Clergy United for All Families was attended by over 100 clergy. Check out the picture of that press conference for a study in contrasts. That is what All the Archbishop’s Men was responding to – the fact that the Vote No campaign has boldly and aggressively stated that their side does not own God and does not own religion. It seems that the fact that M4M has far fewer public and media events than Minnesotans United, whenever they do send out even the thinnest of press releases all of the press corp rush to cover them. That’s the only explanation I can find for the coverage they received this week for absurdly claiming that Minnesotans United is “stalking” Vote Yes supporters. If you follow M4M on Facebook or Twitter, you’ll notice a familiar ring to this insipidness. M4M sure spends a lot of time talking about how victimized they are. Even though they are seeking to put their particular reading of Scripture into our state Constitution, it is their religious freedom that is being infringed upon. Even as they push the lie that children in gay families are psychologically damaged, they are being oppressed! Any time any random person at the state fair looked at an amendment supporter, their campaign spokesman Andy Parrish would breathlessly tweet his horror. People are being mean to us! Because remember – they chose to put this divisive amendment on the ballot. They chose to divide our state and focus other people’s marriages. This week, they declare Vote No supporters to be godless heathens. But, really – they are the victims. Our state and our culture are in the middle of a conversation about the meaning of marriage. Proponents of this amendment want to stop that conversation. I believe with all my heart, that if we do the work we need to do in the coming weeks Minnesotans will not stop the conversation about marriage. ← Ann Romney: Was Marie Antoinette Ever Sent Out to ‘Humanize’ Louis XVI? I’m voting “no” because I am Catholic and follower of Jesus Christ. I’m also a lady. Sorry to poke holes in your theory, Mr. Darrel. Good for Kim and John. Where is the voice for those Catholics who believe that everyone should have the same rights, despite what out-of-date theologians believe? Why must the clergy of my faith bastardized the acceptance and forgiveness of Christ into exclusion and prejudice? Im voting “no” because im very much inlove with my fiance of 3 years and we are both women. I dont think somone should be able to tell me that my love isnt “real” or just as good as their love. I dont understand how my relationship is hurting your family and how it has anything to do with it. People who are voting “yes” listen up.. Your more likely to have a child a brother a sister, a aunt, a uncle, a cousin thats gay and what; your going to treat them the same way as you do now? Or are you going to let it get into your head? Then the only people in the end that your hurting is YOUR family. Dont limit who I can marry. Dont take my rights or we might have to take yours.